The tragic shooting death of a 2-year-old girl by her 5-year-old brother this week was compounded by the fact -- baffling to many who don't use guns -- that the .22 rifle the boy used has been given to him as a present. The shooting was also the fourth this past month in which a child fired a gun at a sibling or parent. The most recent incident happened Wednesday night in Auburn, Wash., when a 7-year-old boy accidentally shot his 9-year-old sister in the leg. The boy had grabbed a .22 caliber rifle from another brother's closet. Lobbyists and advocates across the country are growing increasingly indignant over such shootings, and websites like Kid Shootings and Oh Shoot have now sprung up to track such incidents. The shooting that has focused major attention on young kids with guns, as well as the gun industry's growing focus on young children as the next generation of customers, was Tuesday's fatal shooting in Cumberland County, Ky.
At about 1 p.m. the boy used a rifle that was given to him as a gift to shoot his sister in a moment when his mother stepped outside. "The weapon is a single shot .22 caliber rifle," Cumberland County police spokesman Billy Gregory told ABCNews.com. "One of the parents was at home at the time of the shooting. She had stepped outside the residence. She was cleaning and stepped outside to empty a mop bucket, and heard the shot and ran back inside." Gregory said that the case is currently a death investigation, and detectives are waiting for findings from the coroner. "When you're dealing with grieving parents and a young child who shot his sister, there are a lot of muddy waters we have to wait for to clear," he said. Cumberland County Coroner Gary White told The Associated Press that the rifle was kept in a corner and the family didn't realize a bullet was left inside it. "It's a Crickett," White said. "It's a little rifle for a kid. ... The little boy's used to shooting the little gun." 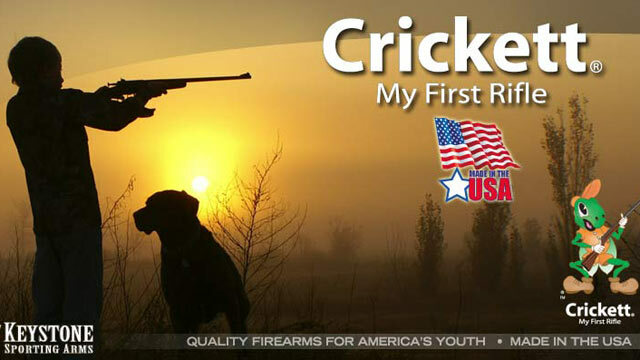 The Cricket model was called "My First Rifle" and is manufactured by Keystone Sporting Arms. The website for the brand, which uses the slogan "Quality firearms for America's youth," says that "the goal of KSA is to instill gun safety in the minds of youth shooters and encourage them to gain the knowledge and respect that hunting and shooting activities require and deserve." Though KSA's website for Crickett rifles does not specify the age range for use of its products, the site does have a "Kid's Corner" which shows images of children, who appear to be from 5-12, holding rifles. The rifles come in a range of colors, from brown to hot pink to orange. The company produced 60,000 Crickett and Chipmunk rifles for kids in 2008. When contacted by ABCNews.com, a representative for Keystone Sporting Arms, located in Milton, Pa., said that the company is not answering questions. The shooting in Kentucky on Tuesday and the one in Washington on Wednesday were the latest in a series of shootings in the last month involving young children. In early April, Brandon Holt, 4, was shot by his 6-year-old friend in New Jersey while the two were playing a game of "pretend shooting," also with a .22 caliber rifle. The following day, a 4-year-old boy in Lebanon, Tenn., fired a gun that killed his mother. Josh Sugarmann, executive director and founder of the Violence Policy Center, a lobbying group working to tighten the regulation of firearms, told ABCNews.com that as the traditional market of white male gun owners is aging, the industry is looking towards a new market. "There is a wide range of gun manufacturing targeted at youth," he said. "The gun industry and gun ownership is declining, it has been for decades, and like tobacco, the industry needs new customers … The most vulnerable years to entice children as future gun customers is during their youth." Sugarmann said that the gun industry's marketing to youth has been going on for years, and has been ramped up over past 15 years or so. He points to a summer 2007 editorial in Shooting Sports Retailer magazine in which columnist Bruce Bear discusses how to market to a newer, younger customer. "It's absolutely critical for us to pass a love of shooting and hunting on to the next generation," Bear wrote. "Due to heavy public sensitivity to the irresponsible promotion of firearms to youth, every promotion should foster both respect for and safety with firearms." According to the Violence Policy Center, from 1977 to 2010, the percentage of American households that reported having any guns in the home dropped more than 40 percent. The cause, the group believes, is the aging of the current gun owning population and a lack of interest in guns by youth. Sugarmann said that the ongoing marketing effort towards youth is no shameful secret, and that the focus is industry wide. The solution as he sees it is legislation to keep guns out of the hands of the youth. "We believe possession laws should mirror laws for purchase 18 for long guns, 21 for hand guns," he said. "The idea of putting a gun into a child's hand should be viewed as a crime."